French painter and printmaker. 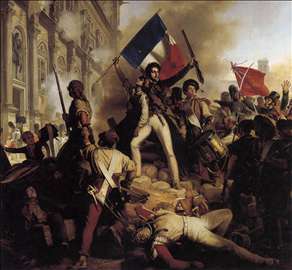 He trained first under Jacques-Louis David and then under Jean-Baptiste Regnault, Antoine-Jean Gros and Franois Grard. He made his dbut at the Salon in 1808 and exhibited there until 1867. It was in 1819, however, that he established his reputation by winning the gold medal for history painting. The following year he exhibited one of his most important paintings, A Gypsy Predicting the Future of Sixte-Quinte (1820; untraced). After this there followed a number of paintings on historical and religious subjects such as General Cond at the Battle of Rocroy (1824; Versailles, Chteau), Eudes, Comte de Paris, Raising the Siege of Paris in 886 (1837; Versailles, Chteau) and Procession of Crusaders around Jerusalem the Day Before the Taking of the Town, 14 July 1099 (1841; Versailles, Chteau). See more details about "The Battle for the Town Hall, 28 July 1830"